Abrasive blasting can remove soot, mould, odours and stains, and profiles surfaces so that they are ready for repainting, plastering or rendering. 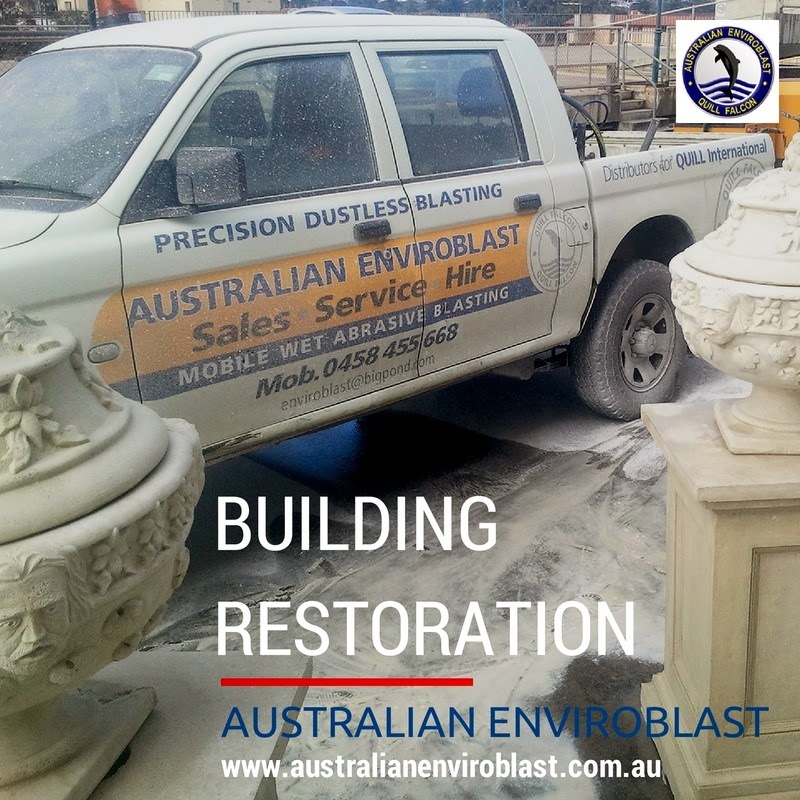 The Australian Enviroblast wet abrasive blasting system removes rust and corrosion from all metal surfaces and structural steel. Around the home, abrasive blasting is highly effective at removing corrosion from your patio or verandah, intricate lattice work, garden trellises, gates and fences, garden sheds and exposed pipes. The Quill Falcon Kwikblast® Dustless Blasting System is also suitable for use on a much larger scale. Wet abrasive blasting can be used to clean and restore warehouses, factories and retail premises, agricultural and industrial machinery, as well as trailers and horse floats. Although it is powerful and fast-working, wet abrasive blasting is also extremely gentle and so can be used on soft surfaces and delicate materials. This includes wood and timber, meaning that stains, mould, paint and graffiti can be removed from all kinds of wooden structures and surfaces, including decking, outdoor furniture, stairs and fences. Abrasive blasting is suitable for cleaning and restoring wooden structures and surfaces in domestic, commercial and marine environments. Graffiti can be an eyesore when it’s in an unwelcome or inappropriate place—even if it has artistic merit! It is particularly disfiguring when it’s found on commercial and retail premises, or on public buildings, and can detract significantly from a property’s value. Our abrasive blasting services are especially effective at removing graffiti from all types of surfaces, including brick, concrete, bitumen, metal, steel timber and PVC . The process, however, is gentle and leaves the original surface intact and smooth, ready for repainting or re-coating. Graffiti removal using wet abrasive blasting can be undertaken in any location and is particularly suited to use in public spaces, because the process produces little dust or residue, and so there is minimal disruption to the surrounding area and no environmental damage. Furthermore, our equipment is completely mobile and flexible, which means we can reach and clean away graffiti in the most out-of-the-way places. To find out more about Adelaide abrasive blasting, please visit our website or email us.